I made this one about a month ago, but have not gotten around to posting it. I mostly followed my normal stir-frying techniques. The main difference was the sauce. I used about 4 Tbsp of plum sauce, and mixed in some of the liquid from the canned seitan. I also added some rice wine vinegar. 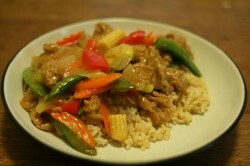 I also put pineapple chunks in the stir-fry to add to the sweetness. It turned out very nicely.